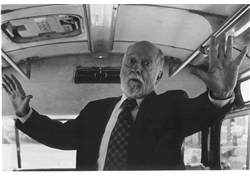 Charlie, in his early seventies, boards the local bus one morning and ushers in a sense of cheer and warmth that soon engages many of the other riders. His open friendliness brings a refreshing change in a world of isolation and self-protection, and his cheer has a winsome effect on the other passengers. Guaranteed to bring both laughter and tears, this entertaining and powerfully moving short film will delight and inspire your audience. It will also open the door to discussion on issues of ageism and intergenerational appreciation. As an elder role model, Charlie’s character presents an empowering image of older adulthood.